Make studying for your next stripe easy! 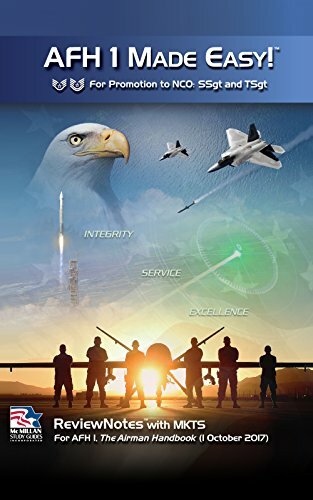 Get AFH 1, The Airman Handbook, exactly the way you need it – summarized and ready to review. Our AFH 1 Made Easy! eBook condenses vital information from the 2017-2019 AFH 1, providing a simple way for any SrA or SSgt to get ready for test day. With an overview of key points and the MKTS values for every section, it’s never been easier to focus on what’s most likely to be on your Air Force promotion exam! Our eBooks use straightforward language to help you absorb the information, and paragraph citations point you to the source material in The Airman Handbook. Plus, you can rest assured that by choosing McMillan Study Guides, the makers of AFH 1 GOLD (formerly PDG GOLD), you always have the most accurate content and the most thorough coverage. With more than 200,000 copies sold, AFH 1 Made Easy! is the proven way to earn your next stripe. Take it from the thousands of Airmen we’ve helped earn promotion: our guides work.